It's not often I agree with Chris Patten but he talked a lot of sense on last evening's World Tonight (Radio 4). The former EU foreign affairs commissioner and former Tory Chairman was reacting to 'GasGate' (as I shall call it) and Russia's apparent attempts to punish Ukraine's Orange Revolutionaries for rejecting its preferred presidential candidate. The man who has been Chairman, Governor, Commissioner and is now Chancellor and Lord argued that the EU (and the west in general) had been too soft on Russia for too long. The EU has attempted to bring Russia into the family of western democracies by treating it with kid gloves, inducements and membership of the G8 (even though its economy doesn't warrant it). Rather than accepting these encouragements to become more democratic Mr Putin has become increasingly authoritarian and, says Patten, bullied its neighbours. As an illustration of policy pusillanimity we have recently witnessed Gerhard Schroeder behave in an ethically dubious way by taking a €1m pa job from Russia's Gazprom for involvement in a project he rushed through in the dying days of his Chancellorship of Germany. Lord Patten recommended tougher treatment of Russia. He said that it was "extraordinary" that Putin had been allowed to assume the chairmanship of the G8 even though it was going "backwards on democracy". He urged the other G8 leaders to tell Russia - privately or otherwise - that its recent behaviour was unacceptable. He also urged the EU to be warmer to Ukraine's aspiration to Union membership. 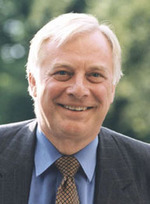 Chris Patten said that the west had done nothing about Russian misbehaviour in Moldova and Georgia because it was afraid of upsetting a major supplier of its energy needs. The west should remember, he said, that Russia's narrow economy hugely depended upon Europe's custom and it needed to be more assertive. Energy policy is likely to be an increasingly important theme in coming years. World competition for oil, for example, has seen an increasingly thirsty China form strategically close links with Venezuela, Sudan, Iran and other ugly regimes. The Wall Street Journal noted only yesterday how Big Oil companies only account for 16% of the world's current production. The real powers in the world are "the Saudi state oil company, the Iranian state oil company, the Venezuelan state oil company, etc". If Mr Cameron is looking for a big issue to face up to, they don't get much bigger than the looming energy crises. Hear hear. Let's not forget that Putin also helps to prop up morally dubious regimes like that of Lukashenko in Belarus and Karimov in Uzbekistan. What we do in regard to Russia should be based upon our national interest, not silly moral posturing. I would recommend the Collapse of British Power by Corelli Barnett to show what happens when politicians begin to see themselves as missionaries. Gerhard Schröder's extraordinary career seems based on the so-far successful premise that whatever he does, nobody remembers for long, and that his personal alloy of metallic charm, chutzpah and feel for his countrymen's instincts takes care of the rest. Less than a month after leaving office in November, he's taken a job as the chairman of a Gazprom subsidiary, at time when the Russia of Schröder's close friend Vladimir Putin is intent on turning the enormous energy reserves Gazprom controls into a foreign policy lever that would reinstate Moscow as a center of world influence." "If Mr Cameron is looking for a big issue to face up to, they don't get much bigger than the looming energy crises." Hear hear, Editor. Energy policy was absent from the leadership race, although Liam Fox had promised that his next speech, had he remained in the race, would be on energy policy. I would like to have heard it. Given the global strategic importance of secure and sustainable energy, it is I suppose possible that it might be squeezed within the remit of his Defence portfolio. But this is a serious test for the West. The concentration of energy resources in parts of the world with little or no commitment to democracy and good governance represents a significant long-term threat. It illustrates the importance of recognising that the furtherance of human rights, freedom and the rule of law, as well as being right ends in themselves for our foreign policy, are also now vital national interests. At the same time we also need to ensure that we develop our environment policy in tandem with our energy policy. The two cannot be kept separate. I dislike Putin and hearing this is a breath of fresh air. Bullying Kiev because Kiev wishes to make its own path cannot be justified. This is all very interesting stuff, but I have yet to hear what prctical steps we should take against Russia, other than taking away her chairmanship/membership of the G8. I suspect Putin's answer to that might be to turn the tap even tighter. We must face the fact that unless we can find alternative supplies, they have us [or should I say the rest of Europe mainly, as we still have our North Sea fields in the short term] over a barrel. I may be cynical but I detect a connection between the Patten's desire for a public profile and the appointment of his former aide, Ed Llewellyn, as Cameron's Chief of Staff. Expect Patten to be appointed to a key Party role before the end of the month! I should also point out the irony of a former EU commissioner criticising a state for being undemocratic - pot calling the kettle black! What next - will he attack Russian corruption? People in glass houses should not throw stones! "Hear hear. Let's not forget that Putin also helps to prop up morally dubious regimes like that of Lukashenko in Belarus and Karimov in Uzbekistan." The word "dubious" implies there is some kind of doubt over their morality. There is no doubt at all that there are no morals present in those regimes. Karimov sees fit to deal with protests by shooting 500+ unarmed demonstrators (for which Putin congratulated him), and previously boiled some dissidents to death. Lukashenka has rigged every national vote for the last 11 years, made protests illegal, outlawed free speech, made landlords turn opposition NGOs out of their offices, made it legal for security services to shoot at protesters, closed down independent academia, forced students involved in opposition activity to be expelled from universities, censored the press, just purchased internet blocking material from China to stop the spread of dangerous information, and liquidised several opponents. The strain linking all these things together is pre-emptive authoritarianism: knocking out the opposition before it becomes a threat. The internet, for example, is available to only 2% of an impoverished nation and yet he still wishes to stifle its potential for spreading dangerous ideas like democracy. Ballot boxes have to be stuffed and result protocols made in advance even though the prevention of opposition media access means Luka would win anyway without them. These are similar to Putin's actions in restricting NGOs, imprisoning those who finance the opposition (Khodorkovsky), appointing regional governors himself and rigging elections. None of his victims were a real threat at the time and he would win the elections anyway without cheating: but allowing opposition and democracy to exist now could mean it expanding into a threat in the future, so he nips it in the bud. No wonder he is such buddies with Lukashenka. The list of dictators he supports does not actually stop there either. As well as opposing the Orange Revolution, he stood by the now ousted dictator President Akayev of Kyrgyzstan, and others who refuse to allow silly ideas like free elections to get in their way in the former Soviet Union, such as Presidents Aliyev, Nazarbayev and Niyazov of Azerbaijan, Kazakhstan and Turkmenistan respectively. To suggest we turn a blind eye to all this just because Putin had some flirtations with economic liberalism (which have now been reversed, see the nationalisation of the oil companies and the treatment of the companies of businessmen who finance the opposition) and that all of this is just necessary strong leadership to implement that, and the EU's complaints are just jealous carping, is incredibly naive. Hopefully that all deals with the first issue of whether Putin is actually a problem. The second issue is whether it is wise to do anything to try to stop him. Will isolation from the international community make things worse? The things we can do at the moment are to support NGOs, civil society and free media by financial and political means, offer asylum to anyone affected by Putin's crackdowns, and see what the reaction is. The energy relationship is an interdependent one and Russia relies on the West's custom just as the West relies on Russia's gas. Risking full-scale diplomatic freeze may not be something Putin is willing to contemplate. In power games the West is many times more powerful than the world's 16th-largest economy. This, though, needs all of the West's most powerful nations to present a united front against dictatorship. It needs the Bush administration to stop denying what is going on, and the German government to abandon the policy of the old one. It needs Chirac to stop playing silly buggers and do the right thing for once. All of that would be a start. "The word "dubious" implies there is some kind of doubt over their morality. There is no doubt at all that there are no morals present in those regimes." You're right. I withdraw the word 'dubious' and replace it with 'empty' (for want of a better word). The thug that Putin has installed in Chechnya is another person I'd add to the list of Putin's undesirable associates that seem to operate in a moral vacuum. Putin is a thug, but he's suprisingly adept at diplomatic positioning. The Ukrainian gas episode was aimed as much at the West as at maintaining the old back yard. After that, which country now will publically speak out against Putin's dictatorship, with it's explicit willingness to use energy as a political tool? We'll deal with Russia just like we do with Saudi Arabia: hear no evil. After all, if nobody said anything after Chechnya "voted" 90%+ for Putin (!! ), they're not going to now.